Thinking of settling down in this beautiful place? Orcas Island real estate businesses and professionals are available and eager to present the San Juan Islands’ wide range of home locations. San Juan County vacation rental permit assistance and property inspections are also available through several Orcas Island services. Get acquainted with the Washington State Ferries and come explore the real estate options in the San Juan Islands today! 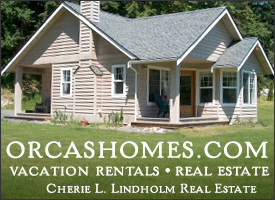 We offer the largest property management company on Orcas Island with many vacation rental homes available in season. We also offer buyer representation to make your real estate transaction much easier and comfortable as a buyer. We are not affiliated with any major franchise organization, although we’ve been asked many times to be a part of that world. We really believe in the personal touch and service to our customers and clients, in old fashioned values, and ethics. Please call or email and let me tell you about living in "Paradise" in the San Juan Islands. As an elected Fire Commissioner, appointed Civil Service Commissioner, Trustee of the Community Center and member of many other organizations, I am very familiar with the Island. And as a member of the Orcas Island multiple listing service, I have access to information on all listed properties for sale. A boutique real estate agency with “The Knowledge You Need to Make the Right Move.” Teri Williams’ years of experience in local real estate, land use, title examination and permitting make our feasibility studies extremely thorough. Sandi Friel’s incessant research helps us find you the right property – even when it’s not listed for sale. We have a passion for what we do, and you’ll be able to relax and know all details are being handled with competence. If you’re not ready to list or purchase, keep tabs on the local market by subscribing to our quarterly newsletter. 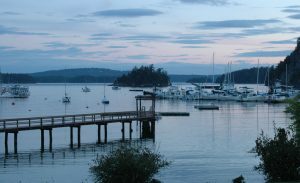 At Orcas Island Realty LLC we dedicate ourselves to locating your ideal piece of San Juan Islands real estate. 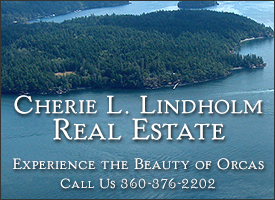 Our experienced Brokers have a long standing tradition in Real Estate Sales and are your source for the best personal service available on Orcas Island. Are you dreaming of Island Life? Let us help you make those dreams come true. As residential specialists with twenty years of experience, we have the knowledge and enthusiasm to provide you with the best real estate services on Orcas. Located in the heart of Eastsound Village on Picturesque Orcas Island in the San Juan Island Archipelago. My name is Jon Boyer and I gravitated from Seattle to the San Juans in 1981 and never looked back. My Grandfather operated Boyer Real Estate next to the Pike Place Market in Seattle for many years beginning in the 1940's and my father was also a Seattle REALTOR® for many years. Top notch home inspections, structural pest inspections, and energy audits. serving all San Juan and Skagit County. Whether you’re buying or selling a home, I am truly committed to providing you with the absolute highest level of service and professionalism. Ultimately, you can expect nothing less than a very thorough, thoughtful, and professional Home Inspection and Report. OPAL (Of People And Land) Community Land Trust is a non-profit organization that provides permanently affordable housing for islanders. San Juan County has the highest housing affordability gap in the state, and OPAL's members are committed to maintaining economic diversity on Orcas Island. OPAL is working to maintain the character, vibrancy and diversity of the Orcas Island community by acquiring land and creating permanently affordable homes. Orcas Island, one of the San Juan Islands located in the Salish Sea between the Washington State mainland and Canada’s Vancouver Island, encompasses some of the most extraordinarily beautiful real estate in the world. Unspoiled and uncrowded, it offers a quality of life difficult to find in today’s world. We offer a full service office showing the most inviting property in the world. I’ve spent most of my life in the San Juan Islands. 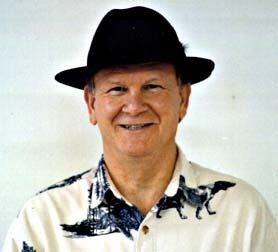 My sales record of consistent top-producer is a result of brokering real estate in this unique environment for over 35 years. During that time, I’ve developed expertise in land use, private islands, waterfront, commercial investments, permitting and finance. As a life-long “local,” I have a special love for island life, and extensive knowledge of all island properties, in village communities and secluded backroads alike. Armstrong Electrical Solutions LLC provides our clients with knowledgeable and thorough solutions that fully encompass their needs and desires. We turn problems into solutions, bringing relief to those we serve. Our primary client base is located in the San Juan Islands of Washington State, with our offices located on Orcas Island. At Armstrong Electrical Solutions LLC we ensure individualized attention and exquisite detail in our work. We will work on your 50 acre, $30 million estate, the valley farmhouse, or the dock at your family's quaint cottage on the waterfront. Full service banking and investing with excellent customer service. Hours: Drive-up window 9:00 – 5:00; Lobby 9:30-5:00; ATM 24 hours. Safe Deposit boxes and night deposits available. Snowbird provides year round full service property management services, since 2003. Whether an island resident, or a seasonal visitor, we thoughtfully care for you and your Orcas home with attention to security and detail providing you peace of mind. • Home safety check • Project management • Landscape maintenance • Assist with personal services • Systems maintenance. Our qualified, friendly staff is island knowledgeable and committed to maintaining a safe and welcoming environment for our clients. You name it and we'll do our best!